Now I’m not looking at the story of the games, describe that as you like; be it concise, complex or convoluted, I’m looking at game play, set pieces and atmosphere across the numbered games in the franchise. Looking back at the original, was it really a horror game? It certainly starts off that way, relying on traditional horror film stereotypes, a big mansion, zombies and jump scares. But aside from a little jump here and there did the zombies scare you that much? As you progressed it became much less like a horror film; you found powerful weapons, fought against experiments in an underground lab but your typical zombie by that point was little threat, as a shotgun round would send its head flying across a room in many directions, though with survival the running theme, it was recommended you saved ammo. But again, is survival fear? For me at least the greatest fear is in the loss of control, and in the early Resident evil games you had little control over your character; tank controls and the ability to shoot up, down or ahead, combined with the restricted camera angles exploring new areas could be a very tense thing in itself, again being more survival and less actual horror and for me at least that’s where the heart or the fear came from. 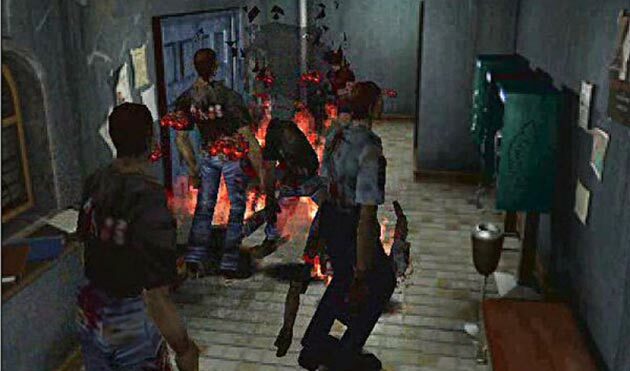 It could be argued that this is where things started going in the wrong direction for the scare aspect of the series, though Resident Evil 2 has no part to play in that, given that it just kept the controls the same and made everything else that came before, bigger and better. While it did introduce the Mercenaries mode (on the Dreamcast version), which I guess is the first truly action orientated game play in the series but it’s not in the main game so it’s not important enough to dwell on. Resident Evil 3 is where it changed; giving the ability to turn around quickly and dodge it you had the timing to pull it off. However it did also add Nemesis which hunted you across the game and random enemies to keep you in suspense, as you would never know who would pop up next. It truly created a new type of fear in the player outside of the control and setting of the game. This is where the real discussion begins; Resident Evil 4 was in development for a number of years and went through various concepts, one of which became Devil May Cry (and even in that you can see how it worked in the style of RE games, fighting bosses multiple times for example). But while that was deemed too extreme to be a RE game there was another that received a public showing, the afore mentioned hook hand game. Set to feature Leon infected by a virus it seemed to make a move into silent hill territory with more occult enemies and hallucinations. Ultimately however it was decided this was again straying too far from what the Resident Evil series was. Now cutting into the argument I think it’s worth mentioning Shinji Mikami; the Resident Evil series was his brainchild and he had input in every game, creating the many incarnations of Resident Evil 4 as well as essentially creating the over the shoulder 3rd person shooter genre. I mention him now as this is where he parted ways from the series, moving to Clover studios from then on and eventually his own studio, but he set the foundations for the future of the series. RE4; known for transforming the series from ‘survival horror’ to’ survival action’, did so well that the future of Resident Evil games seemed assured in this new format. 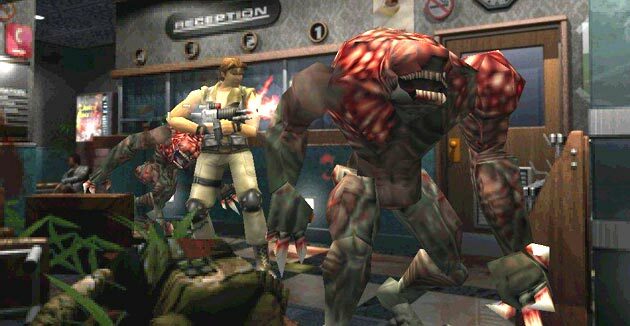 However fans of the originals, even when they accepted that it was still a great game, were critical of it not being a true ‘Resident Evil’ game. But again this is where I ask you to look at the series as a fight for survival series and not a horror one, because as a horror RE4 fails, but as pure survival (which it truly becomes once Leon becomes injected with the parasite and get s a personal stake in the story aside from it being a rescue mission) it’s just like the other, it just goes about it differently. The big difference between everything that came before was the control system, switching from the tank control and restricted camera, it became third person. 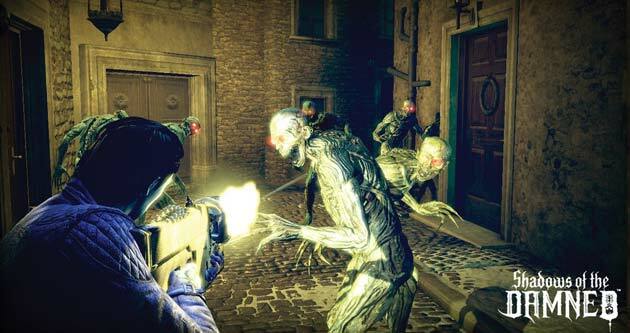 The zombies were replaced with new enemies as well which drew criticism, but again they serve an important purpose in the gameplay experience. Since now you had the ability to always see in front of your character and target anywhere you wanted to shoot on the body of enemies, a slow moving zombie that a shot in the head would kill, would never be a threat; so the las plagas were introduced. These would throw things at you, move quickly, travel in big groups and most importantly of all, shrug off bullets. This meant even with a new set of controls, the fear from surviving was still just as high as it always had been; you were always outnumbered, but had nowhere to go but push forward. The plagas were intelligent and would wield weapons and pile on series dread in the player. When the chainsaw man came along you knew you were in trouble and one hit from him and you were gone. Every time a one hit kill plaga was around there was a complete tonal shift, as you never felt like you had the upper hand and would spend more time running to find a way to fight them off. You were given select melee attacks as well to help fight back but only when you achieved a successful hit to the head or leg of an enemy, stunning them, thus rewarding those who took their time to cautiously fight and take their time, even in tense circumstances. 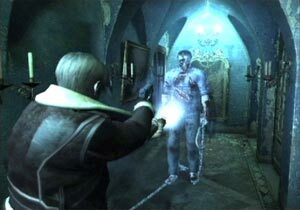 It was a new evolution for the series after it was beginning to stagnate and represented a new way to be scared; not in an all-out horror film way, but in a tense stomach turning dread induced by placing you in extreme situations… just remember the first time you played RE4 and had to survive the village onslaught at the start of the game. Now Resident Evil 5 is really the game changer, while what I’m about to accuse RE5 of is likely going to be argued that RE4 is also guilty of, however stick with me and I’ll explain my reasoning. I’ve probably played RE4 and 5 the most out of all games in the series, and they are both fantastic games in their own right, but Resident Evil 5 is most guilty of not being Resident Evil 5. While all the changes in RE4 were series changes, at heart it adapted itself to match what you could do; the fear came in what you were up against, be it hordes of people or one lone enemy that would have you on your toes at all time. It wasn’t the traditional fear the series was known for but it had evolved. RE5 however seems to betray that foundation The game itself doesn’t bring out the fear like its predecessor did; where you’d have a true feeling of dread before nothing that came your way in this game really felt like a threat to you. It’s unfortunate that RE4 defined 3rd person shooters, because everything really then tried to better it and in terms of control, a lot did. Resident Evil 5 then added ideas from other games. The most common complaint I hear is enemies wielding guns against you, which lead to people moaning about a lack of a cover system. A perfectly reasonable thing to ask for in a shooter, but that argument really just reinforces that the game is nothing but a shooter with elements from the other RE games. Even the lickers that were brought back for the game seem much less threating now when you can poke a shotgun in their face, pull the trigger a few times and move on. This game didn’t adapt anything from the old games to make it worth fearing in a new way, despite what they added that was new. I don’t think a giant hammer wielding hulk matches the tense fear that a guy with a bag on his head wielding a chainsaw. It seems that in terms of what the Resident Evil games are known best for providing, the game was less of a sequel and more of a side step. A good game but perhaps not the Resident Evil experience… and we’ll just forget the turret sections in the back of trucks! Now returning back to Shinji Mikami, who I mentioned departed from the studio after the conclusion of RE4; I’m going to go on a bit of a tangent for a bit and turn the subject to ‘Shadows of the Damned’; Mikami’s most recently released game. After the completion of RE4 he continued to work on games that evolved the control system created for other game types, and this, and to a certain extent ‘God Hand’ (a PS2 3rd person brawler), represented how he might have evolved the RE series had he continued his involvement with it. 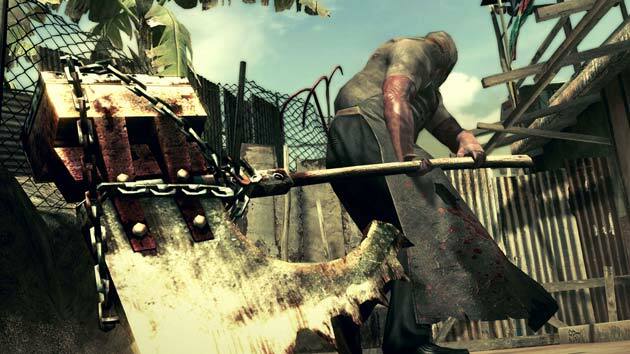 To compare it to RE5, it controls exactly the same, with the addition of melee attacks, strafing and a dodge roll, while scaling back the amount of weapons. So surely that’s got even more in common with a mainstream 3rd person shooter (save for weapons available to you), well yes and no. First off we’ll address the argument of setting to get it out the way; Shadows of the Damned is actually set in Hell, while Resident Evil 5 is just a monster story still grounded in reality. While this gives Shadows of the Damned more creative freedom to create even more scary locations and monsters, looking at the differences between Resident Evil 4 and 5 proves that what you have access to in development is nothing if you don’t know how to use it effectively. For example, Mikami knows how to bring out emotion in the player and does so not through what you face but what you have to achieve to succeed. Every chapter in Shadows follows a different theme, while sometimes it resorts to generic fighting of enemies to progress, a lot of time there will be more than that; shooting demons with light to make them killable, removing the dark from the area before you can hurt demons, and that drains the life of the player, sometimes it’s just running for your life. In fact every chapter tries something different so you’re never truly ready for what comes next. The running sections in particular fill you with dread, because if you get caught you’re dead! I recommend Shadows of the Damned over Resident Evil 5, as it’s just in a different league. It also has Suda 51 going for it who worked on the game, so you have shocking imagery and the composer who worked on the Silent Hill games… and the music in Silent Hill drowns you in atmosphere, something RE rarely achieved. 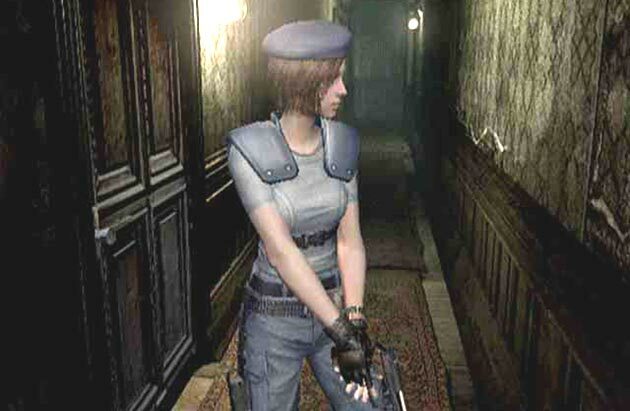 So my point I’ve worked my way up to after all this is that the fear in the original games came from placing you in survival situations where the controls you had were limited and what you could see was restricted, giving more control meant changing what the game throws at you, as RE3 did with a dodge system added to counteract Nemesis and randomly set enemies as well as the 180 spin. 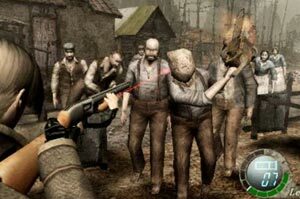 RE4 changed the game, brand new controls where you could fight a room full of zombies off, so the new plagas were made as something that would not stop, was intelligent and would come in hordes that you could not just stand and fight off, especially when I hit kill plagas were around. Resident Evil 5 never managed to copy Resident Evil 4 in the horror aspect of the gameplay, instead opting to be a more traditional 3rd person shooter with a few monster story elements (though still excellent when compared with other shooters). So maybe I’ll close with my thoughts on Resident Evil 6, well what can you tell from the first trailer? It looks surprisingly well done actually and well balanced in atmosphere. 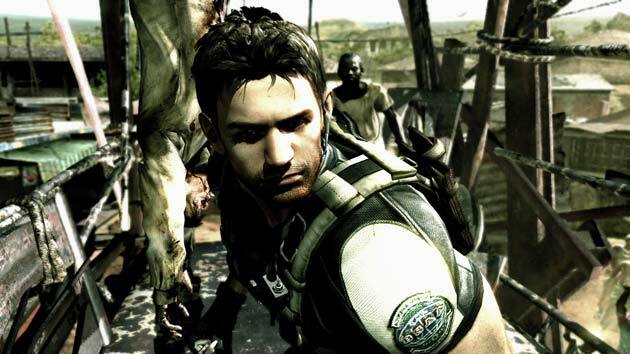 Since after RE5 there are now fans who expect the action side of the game more than the horror, Capcom seem to be looking to deliver on both ends. I’m hoping from what I’ve seen that they are planning on a RE2 style of picking a character and keeping with them through the game, but with different characters having a different gameplay style. Chris seems to have more action and cover based shooting, being dropped into a city with a team, while I hope Leon will have a more isolated experience with classic zombies being more restricted than the open action areas of Chris. The other guy seen who might be playable could provide an interesting new way to look at the game, my theory is that he’s Hunk but there’s some other good guesses too, Wesker’s brother being a cool one. If he’s immune to the virus then I expect the big enemies of the game to be tracking him. You may spend a lot of your time running rather than fighting, or he may not be playable at all. Either way so far the game looks promising and I look forward to seeing if this, like RE4, will be a game I just want to keep playing over and over. Oh and about the logo looking life a giraffe… see for yourself, but remember you can’t UN see it afterwards! Im kind of glad that its not a “mainstream 3rd person shooter” because honestly Gears of war isn`t really my style but the fact that its 3rd person than an average first person shooter game like Halo or something, it really makes things interesting. Your comment about rough controls makes me think of Dead Space. When you first get a weapon and sway it back and forth, you realize they lack a tightness you come to expect in shooters. That lack of security alone creates an atmosphere that can make a game scary, let alone all the horrifying creatures you have to confront.